Ewart Beckford OD (born 21 September 1942), better known by the stage name U-Roy, is a Jamaican vocalist and pioneer of toasting. He is noted for a melodic style of toasting applied with a highly developed sense of timing. Ewart Beckford was born in Jones Town, Saint Andrews Parish, Kingston, Jamaica, on 21 September 1942. He was raised within a religious and musical family; his mother was an organist for the choir at a local Seventh Day Adventist church. The sobriquet U-Roy originated from a younger member of his family who found it difficult to pronounce his first name. Beckford attended Denham Town High School in Kingston. As a young man Beckford listened to the music of Louis Prima, James Brown, Ruth Brown, Fats Domino, Rufus Thomas, Smiley Lewis and was especially influenced by the vocal phrasing of Louis Jordan. Inspired by Count Matchuki he started his professional career as a DJ in 1961 on Dickie Wong’s sound system (originally called Doctor Dickies later changed to Dickies Dynamic) moving later to the Sir George the Atomic sound system. Beckford then worked on Sir Coxsone Dodd’s sound system where he ran the number two set while King Stitt “The Ugly One” ran the main set. This was followed by a period with Sir Percy before he moved to King Tubby’s Hometown Hi-Fi sound system. Beckford’s first single “Dynamic Fashion Way” (1969) was a Keith Hudson production. It was followed by the Bunny Striker Lee production “Earth’s Rightful Ruler” with Peter Tosh. In 1970, Jamaican singer John Holt (then the lead vocalist of The Paragons) heard Beckford toasting over a Duke Reid track at a dance. Holt told Duke Reid about the performance and on his recommendation Duke Reid asked Beckford to come and see him and an informal recording deal was arranged. Beckford’s first two singles released on Duke Reid’s Treasure Isle label, “Wake the Town” (1970) and “Wear You to the Ball” (1970), were Jamaican hits and established his reputation as one of Jamaica’s most popular toasters. Beckford then went on to work with other major producers on the island including Bunny Lee, Phil Pratt, Sonia Pottinger, Rupie Edwards, Alvin Ranglin and Lloyd Daley. 1971 saw the release of Beckford’s DJ version of The Paragons’ “The Tide Is High”. Beckford first toured the UK in 1972 with the artists Roy Shirley and Max Romeo. The tour was organized by Rita and Benny King; the owners of R & B Records based in Stamford Hill, London. In 1975, the album Dread in a Babylon was released in the US, Europe and Jamaica by Virgin Records. The album achieved significant sales in the UK which was due in part to the ongoing expansion of the Virgin label and stores. The track “Runaway Girl” from the album was released as a single in Europe that same year. 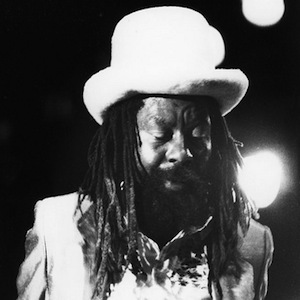 The success of Dread in a Babylon led to a series of Tony Robinson produced albums: Natty Rebel (1976), Rasta Ambassador (1977) and Jah Son of Africa (1978). Beckford’s international popularity led to the album Natty Rebel being released in 1976 on Virgins’ imprint Front Line label in Nigeria as well as in France on Virgin and Polydor. In 1978 Beckford started his own sound system which he named Stur Gav after his sons; the sound system would launch the careers of a younger generation of toasters and singers including Ranking Joe, Jah Screw, Charlie Chaplin and Josey Wales. In 1980 the pop group Blondie had a world-wide hit with the reggae track “The Tide Is High” which prompted Virgin to re-release the original Paragons’ track from 1967 and the 1971 U-Roy version as a single that same year. His most recent album is Pray Fi Di People which was released in 2012. In 2007 Beckford was awarded the Order of Distinction by the Jamaican government for his contribution to music. “Hip-hop….the whole chemistry of that originally came from Jamaica…..In Jamaica all you needed was a drum and a bass. So what I did was go right to the ‘yoke’. I cut off all the anticipation and just played the beats. I’d find out where the break in the record was and prolonged it and people would love it. So I was giving them their own taste and beat percussion wise….cause my music is all about the heavy bass.